A University of Nebraska study by C.S. Wortmann and colleagues published in the August 2010 edition of Agronomy Journal has followed up on previous research regarding the effects of a one-time tillage operation on various characteristics of soil in a no-till cropping system. The current research examined several soil properties five years after a one-time tillage with a moldboard plow, minimoldboard plow, chisel with a twisted shank, and disk, and compared that to the same soil properties under continuous no-till. Stratification of soil test phosphorus, soil organic carbon, and bulk density was similar for all tillage treatments at 5 years after tillage. Water stable soil aggregates were not affected by tillage treatments except that there was more soil as macroaggregates at one location in the 5- to 10-cm depth with moldboard plow tillage compared with no-till. Tillage treatments had no effect on soil organic carbon mass in the 0- to 30-cm depth. Biomass of bacteria, actinomycetes, and arbuscular mycorrhizal fungi was greater with no-till compared with one-time moldboard plow tillage at one location but not affected by the one-time tillage at the other location. Microbial community structure differed among tillage treatments at the 0- to 5-cm depth at one location but not at the other location. Grain yield generally was not affected by tillage treatment. The authors concluded that one-time tillage of no-till can be done without measureable effects on yield or soil properties. This study adds to a study published in a 2007 edition of Agronomy Journal, also from the University of Nebraska. The results and conclusions of the two studies are similar. Research by Marcos Siqueira Neto, at the University of São Paulo in Brazil, and colleagues found that under no-till mulch cropping, soil organic carbon levels (SOC) in the top 30 cm increased every year -- and after 12 years reached levels found in soils under natural Cerrado vegetation. On the other hand, after 23 years of conventionally-tilled cropping, SOC levels never reached the levels found under natural vegetation. No-tillage mulch-based (NTM) cropping systems have been widely adopted by farmers in the Brazilian savanna region (Cerrado biome). We hypothesized that this new type of management should have a profound impact on soil organic carbon (SOC) at regional scale and consequently on climate change mitigation. The objective of this study was thus to quantify the SOC storage potential of NTM in the oxisols of the Cerrado using a synchronic approach that is based on a chronosequence of fields of different years under NTM. The study consisted of three phases: (1) a farm/cropping system survey to identify the main types of NTM systems to be chosen for the chronosequence; (2) a field survey to identify a homogeneous set of situations for the chronosequence and (3) the characterization of the chronosequence to assess the SOC storage potential. The main NTM system practiced by farmers is an annual succession of soybean (Glycine max) or maize (Zea mays) with another cereal crop. This cropping system covers 54% of the total cultivated area in the region. At the regional level, soil organic C concentrations from NTM fields were closely correlated with clay + silt content of the soil (r2 = 0.64). No significant correlation was observed (r2 = 0.07), however, between these two variables when we only considered the fields with a clay + silt content in the 500–700 g kg−1 range. The final chronosequence of NTM fields was therefore based on a subsample of eight fields, within this textural range. The SOC stocks in the 0–30 cm topsoil layer of these selected fields varied between 4.2 and 6.7 kg C m−2 and increased on average (r2 = 0.97) with 0.19 kg C m−2 year−1. After 12 years of NTM management, SOC stocks were no longer significantly different from the stocks under natural Cerrado vegetation (p < 0.05), whereas a 23-year-old conventionally tilled and cropped field showed SOC stocks that were about 30% below this level. Confirming our hypotheses, this study clearly illustrated the high potential of NTM systems in increasing SOC storage under tropical conditions, and how a synchronic approach may be used to assess efficiently such modification on farmers’ fields, identifying and excluding non desirable sources of heterogeneity (management, soils and climate). Ample physical evidence shows that carbon dioxide (CO2) is the single most important climate-relevant greenhouse gas in Earth’s atmosphere, according to a paper in the Oct.15, 2010 issue of Science. The authors of the paper are scientists from the NASA Goddard Institute for Space Studies. The Sun is the source of energy that heats Earth. Besides direct solar heating of the ground, there is also indirect longwave (LW) warming arising from the thermal radiation that is emitted by the ground, then absorbed locally within the atmosphere, from which it is re-emitted in both upward and downward directions, further heating the ground and maintaining the temperature gradient in the atmosphere. This radiative interaction is the greenhouse effect, which was first discovered by Joseph Fourier in 1824, experimentally verified by John Tyndall in 1863, and quantified by Svante Arrhenius in 1896. These studies established long ago that water vapor and CO2 are indeed the principal terrestrial GHGs. Now, further consideration shows that CO2 is the one that controls climate change. CO2 is a well-mixed gas that does not condense or precipitate from the atmosphere. Water vapor and clouds, on the other hand, are highly active components of the climate system that respond rapidly to changes in temperature and air pressure by evaporating, condensing, and precipitating. 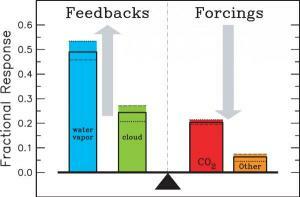 This identifies water vapor and clouds as the fast feedback processes in the climate system. In round numbers, water vapor accounts for about 50% of Earth’s greenhouse effect, with clouds contributing 25%, CO2 20%, and the minor GHGs and aerosols accounting for the remaining 5%. Because CO2, O3, N2O, CH4, and chlorofluorocarbons (CFCs) do not condense and precipitate, noncondensing GHGs constitute the key 25% of the radiative forcing that supports and sustains the entire terrestrial greenhouse effect, the remaining 75% coming as fast feedback contributions from water vapor and clouds. The Arctic region, also called the “planet’s refrigerator,” continues to heat up, affecting local populations and ecosystems as well as weather patterns in the most populated parts of the Northern Hemisphere, according to a team of 69 international scientists. The findings were released Oct. 21, 2010 in the Arctic Report Card, a yearly assessment of Arctic conditions. * Arctic snow cover duration was at a record minimum since record-keeping began in 1966. There is also evidence that the effect of higher air temperatures in the Arctic atmosphere in fall is contributing to changes in the atmospheric circulation in both the Arctic and northern mid-latitudes. Winter 2009-2010 showed a link between mid-latitude extreme cold and snowy weather events and changes in the wind patterns of the Arctic, related to a phase of the Arctic Oscillation. With the climate bill stalled in the U.S. Senate, it is evident that any federal climate regulation will depend on action by the Environmental Protection Agency (EPA), utilizing the Clean Air Act to introduce binding legislation. It is the EPA that is poised to lead the nation from voluntary reporting to binding regulation regarding greenhouse gas emissions. Three regional pacts have formed to regulate greenhouse gas emissions from certain industries in several states, but the EPA’s actions will be nationwide in scope. In addition to introducing new fuel efficiency standards for the nation, the EPA is now focusing on new rules for certain industrial emitters, additional climate regulations, and policy. The rules would subject power plants, factories, and oil refineries that emit 75,000 tons of carbon dioxide equivalent and already under clean air regulations to get operating permits beginning in January 2011. Regulated polluters would include big coal-fired power plants and heavy energy users such as cement, glass and steel makers. Waste landfills and factories not already covered by clean air laws that emit at least 100,000 tons of greenhouse gases a year would get a six-month extension and would not be regulated until July 2011. Sources that pollute less than 50,000 tons per year would not be regulated until 2016, if ever. There is opposition to any EPA action, however. The U.S. oil, gas, and manufacturing industries are strongly opposed to EPA regulations of greenhouse gas emissions. Opponents include the American Petroleum Institute, the U.S. Chamber of Commerce, and the National Association of Manufacturers. Those groups have filed lawsuits against the EPA challenging its right to regulate GHGs using the Clean Air Act. Also, many Senate Republicans and several prominent Democrats are backing legislation de- signed to prevent the EPA from moving forward with the regulations. President Barack Obama has said he would veto any attempts to strip the EPA of its power to regulate GHG emissions. Unless one or more of these moves is successful, EPA regulations will be a key component of the U.S. meeting its goal of reducing its GHG output in the range of 17 per cent below 2005 levels by 2020. There are many details yet to be resolved, including questions about whether the EPA will try to establish a greenhouse gas cap-and-trade mechanism under the Clean Air Act and the definition of “best available control technology” required of certain new and modified industrial facilities that emit greenhouse gases.